In his journeyman’s two years of service, Walter matures, and turns into a handsome young man; he is fashion-conscious and particular in his choice of clothing. His will to further his education as an artist strengthens. 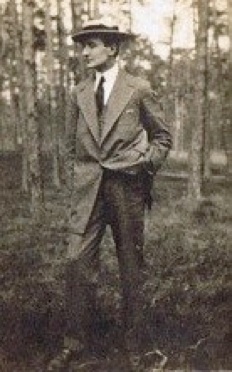 He is accepted at the ‚Königliche Akademie der Künste zu Berlin’ for the summer term of 1913, continuing his studies in sculpture. On September 4, 1914, he is awarded the ‘Künstler-Einjährige’, (status of an artist having successfully completed a one-year-term of studies). This award is an important document, it equals a General Certificate of Secondary Education. The ‘Künstler-Einjährige’ attests Walter Schulze-Mittendorff the “rating of ‘special mention of excellence in a branch of the arts’, since he excelled in his artistic achievements”. 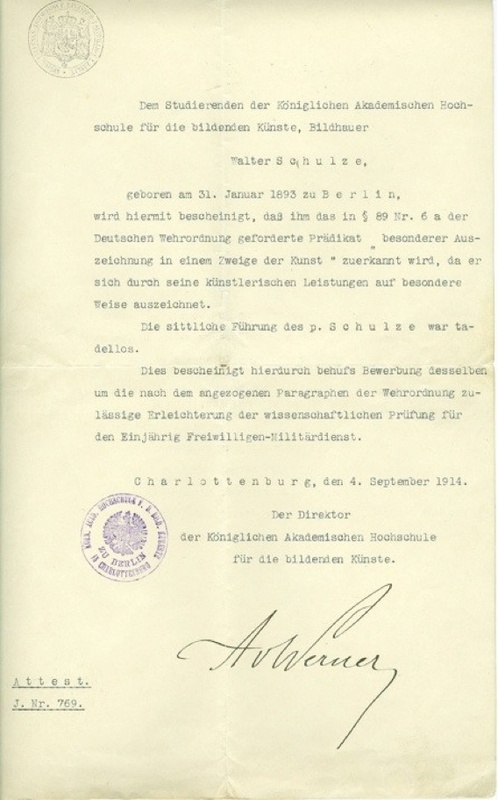 The document is signed with A. v. Werner. Anton von Werner was the director of the ‚Königliche Akademische Hochschule für die bildenden Künste zu Berlin in Charlottenburg’ (Royal Academy of Fine Arts Berlin, Charlottenburg) from 1875 to 1915.